In recent years Ballyseede Castle has gained the reputation for fine dining. Whether it is a five course dinner or sitting but the fire in the Library Bar dining is a must. The most delicate food is locally sourced and presented with all the flair expected from a Castle experience. The castle is neslted in the wonderful town of Tralee. Tralee is the bustling capital town of County Kerry and is home to the internationally renowned ‘Rose of Tralee’ festival, held every August. Ballyseede Castle is located on its own thirty acres of gardens and woodland. At the approach is an imposing entrance gateway with pillars of block granite. The Castle stands on its own grounds at the end of a winding carriage drive. This elegant Castle looks as if it were built to outlive the vices and follies of man. It has been fought over, lived in and loved, and carries forward its ancient grandeur to this age. Following the defeat of the Desmoids in 1584, the Castle plus 3000 acres of land was granted as a perpetual lease to Robert Blennerhassett, the rent being one red rose to be presented each year on Midsummer’s Day. This noble family and their descendants occupied Ballyseede until 1966. Ballyseede Castle is a large three-story block over a basement, with two curved bows on the entrance front and another bow at the south side and a battlemented parapet. Inside the impressive lobby, Doric columns lead to an elegant wooden bifurcating staircase of fine oak joinery, which is almost unique in Ireland. 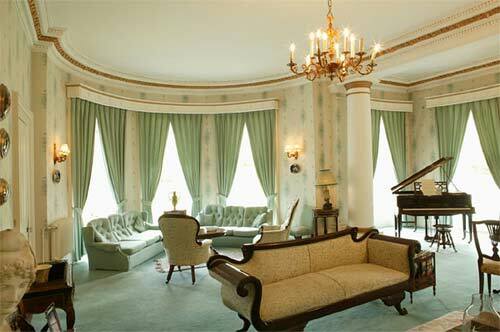 There are two magnificent drawing rooms with cornices plasterwork, adorned by marble fireplaces, which are ideal to have afternoon tea or morning coffee. The gracious dining room overlooks the front lawn with its ancient oaks. Dinner is served nightly from 7pm to 9pm. In the library bar there is a great-carved oak chimneypiece over mantle dated 1627. There is a splendid Banqueting Hall where feastings and entertainment were carried out in a grand manner. To continue its history the Castle boast the ghost of Landlords past and they are known to walk the long corridors in the basement level. On the 24th of March each year the ghost is known to make its presence felt as it did on that night in 1998 when the residents of the castle vacated their rooms and were last heard of when they went to a local bookshop and asked for a book on ghosts. They told the shop assistant they had a frightening experience “they saw a Spirit”. This is the first time anyone was scared of the ghost. The past residents of the castle fondly call the ghost Hilda. 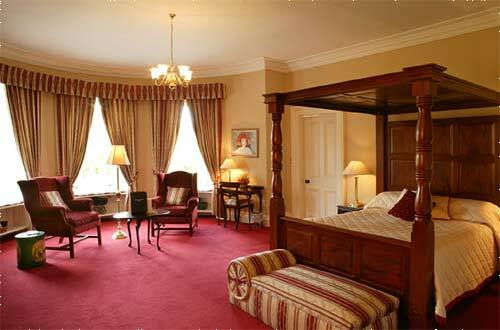 Ballyseede Castle offer you 23 elegant rooms. Some with four poster beds, king size beds and a number of family rooms comprising of two double beds. All Bedrooms are elegant and spacious and come in a large variety from single to mini-suites to deluxe four posters. The en-suites have power showers, hair dryers, and the toiletries are from the Gilchrist and Soames Spa Therapy range and are complimentary for guests to take away on their departure. The upstairs rooms are elegant with high ceilings and the delicate mixture of old world decadence is complimented by modern luxury expected by the discerning traveller. What were once the Lady’s boudoirs have been tastefully transformed into charming en-suites. Enjoy the highest level of comfort, privacy and service. Each visit will be treasured as all rooms offer the ultimate in relaxation, each with its own unique character. All rooms provide beautiful Cotton Robes for each gust and matching slippers. Tea and Coffee is provided to all guests free of charge on arrival and available in their rooms during their stay. Flat screen televisions and a selection of channels in English RTE, BBC, SKY News and TV5 (French) RVR (German). A selection of DVD’s are available for viewing in the comfort of your own room. The bedrooms offer a magnificent view of the grounds of the castle. All the castle’s bedrooms have direct dial phone. 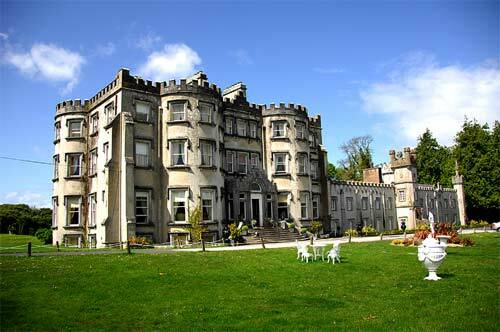 As the only Castle Hotel in Kerry your wedding will be unique. A wedding day is one of the most exciting and important days in ones life. We here at Ballyseede Castle have taken great care in preparing the plans for your special day. Our specially trained staff will assist you in every aspect of preparing and organising your wedding reception. Ballyseede Castle is located on the on the N21, Tralee to Limerick / Killarney road. On the gateway to the Ring of Kerry and the Dingle Peninsula A great location to visit the South-West and the a favoured area to begin the journey along the West coast to Galway.